As CO2 levels in the atmosphere continue to rise (and given the current state of global action they could quite possibly go on rising for much of this century) we hear a great deal about storms and droughts but not a huge amount about the really difficult issue that most countries face, rising sea levels. Although the hydrological cycle will inevitably change as a result of rising temperatures, there is still much research going on to understand what this means in terms of global, regional and local precipitation. By contrast, a great deal seems to be known about sea level, CO2 and temperature, thanks to the paleoclimate record. This was the subject of the first session of the 31st MIT Global Change Forum which was held in Brussels last week in association with Université Catholique de Louvain. The specific focus was the interglacial periods of the last million years which saw global temperatures and CO2 levels at 1850 (i.e. pre-industrial) levels. These relatively warm periods occur every 100-150,000 years (we are in one now) as a result of the additional heat falling on the planet from small variations in the earths orbit around the sun. 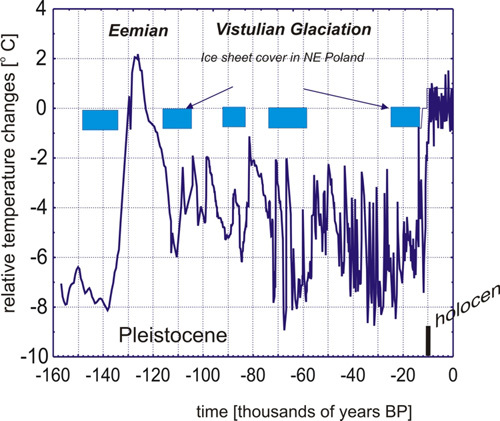 The most recent inter-glacial peak was the Eemian, about 130,000 years ago, which saw both CO2 levels and temperature peak at the top end of the inter-glacial range, but with the CO2 level far below the current 390 ppm. There is good evidence that the sea level in this period topped out at some 7 metres above current levels, before plunging 135 metres as glaciation took hold in the northern hemisphere. This of course raises the issue of where sea level might peak as a result of the current elevated levels of CO2, although the analysis that was presented was more about where so much water would actually come from. Certainly there is enough in Greenland to raise sea levels another six metres, but we know that Greenland didn’t melt completely during the Eemian period as we have much older Greenland ice cores. Rather, the evidence points to a partial melting of the Greenland ice sheet followed by the collapse of the West Antarctic Ice Sheet. 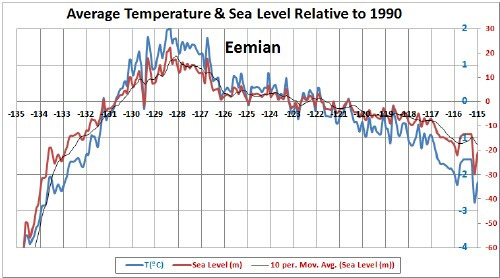 The former contributed some 2.2-3.4 metres of sea level rise and the latter 4.4-6 metres. During this period the polar regions of the northern hemisphere experienced temperature rises of 3-5°C, in response to a global temperature rise of 1-2°C, or less. The rate of sea level rise was 5-6 mm/year or ~5.6 metres over 1000 years. This sounds like an extraordinary amount of time, but we shouldn’t forget that some buildings in both London and Paris are already nearly 1000 years old and still in use! We also shouldn’t forget that the extra radiative forcing driving the change today is likely to be quite a bit more than in the Eemian period. Estimates of near term sea level rise vary significantly, with some studies showing an overall change of up to 2 metres by the end of this century, considerably more than that given in the IPCC 4th Assessment Report. 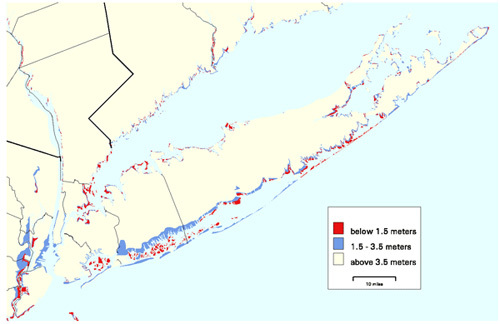 Such a rise could be very disruptive and require considerable relocation of people and infrastructure (see below, Long Island). It was an interesting session and set the stage for another excellent MIT conference. Unrelated to MIT but nevertheless related to the subject above is some recent holiday reading that I enjoyed. The novel, Ultimatum by Matthew Glass, is set in 2033 just as a new President is coming into office in the United States. 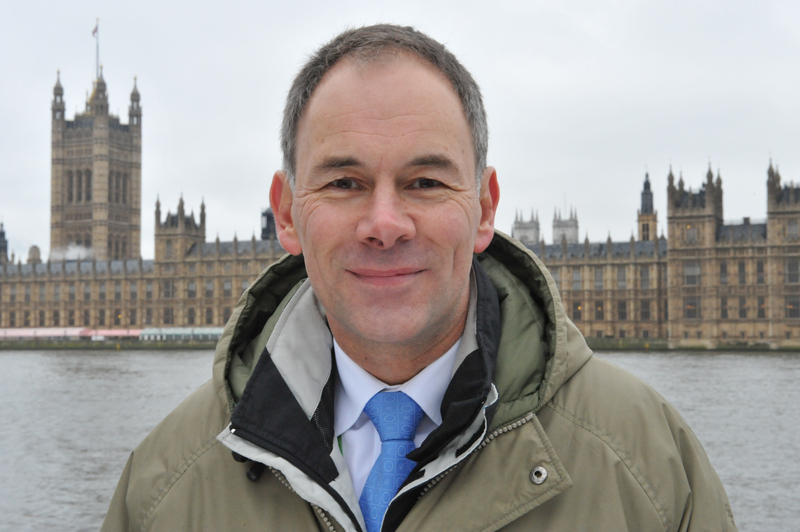 It is a world that has tried hard but done little to address emissions. By this time the US already has a Relocation Program underway, in response to rising sea levels and more severe storm surges. In his first meeting with the outgoing President, the new Commander in Chief learns that sea level rise is accelerating (a fact kept from the public) and that a much more ambitious relocation program must be established. He also learns that a diplomatic initiative with China to agree on real and decisive cuts in emissions is going nowhere. 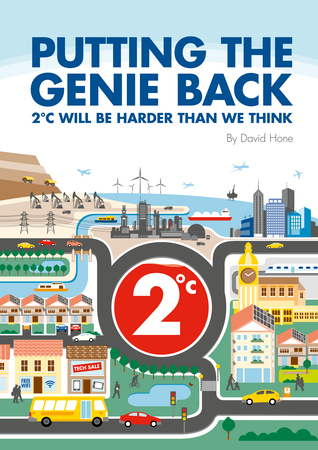 With a President faced with potential social catastrophe in the decades ahead, so a real political page turner begins, ending, not surprisingly in an ultimatum situation with the Chinese over emissions. It’s a good read and puts the science into an interesting political perspective. The price may not be right!